Join the characters of An Extra Mile, the final book in the Sensible Shoes Series, as they journey through the seasons of Lent and Easter. In this eight-week study guide you'll dive deeper into key spiritual practices from the book, using daily Scripture readings and reflection questions designed to help you be attentive to the invitations of the Holy Spirit. Each week concludes with discussion questions and suggested practices for groups to do together. This guide offers the perfect tools for individuals and groups to explore and apply the spiritual formation themes of An Extra Mile along with Mara, Hannah, Charissa, and Becca. Sharon Garlough Brown is a spiritual director, speaker, and cofounder of Abiding Way Ministries, providing spiritual formation retreats and resources. A graduate of Princeton Theological Seminary, Sharon has served on the pastoral staff of congregations in Scotland, Oklahoma, England, and most recently in West Michigan, where she copastored with her husband, Jack, for many years. In March 2013 her book was named one of television personality Kathie Lee Gifford's "favorite things." Book 1 - In Sensible Shoes, you will meet these four women as they reluctantly arrive at a retreat center and embark together on a journey of spiritual formation. They find themselves drawn out of their separate stories of isolation and struggle and into a collective journey of spiritual practice, mutual support and personal revelation. Book 2- We continue the journey as the women face roadblocks in the second book, Two Steps Forward. Sometimes life feels like two steps forward and one step back, but there is always hope. Find your own spiritual journey reflected in their lives and discover the way forward. Book 3 - The third book, Barefoot, takes the women through unexpected turns in their spiritual journeys. Having been challenged to persevere in hope, can they now embrace the joy of complete surrender? 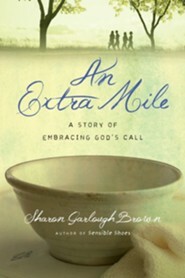 Book 4 - An Extra Mile, the fourth and final book in the series, the women are navigating both deep joy and devastating loss. Travel with these beloved friends as they endure trials that test their trust and their willingness to walk an extra mile. 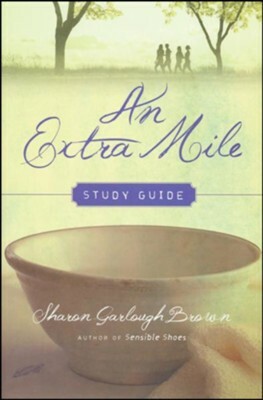 I'm the author/artist and I want to review An Extra Mile Study Guide, Book 4.